Do you love Mahjong Time? Take the next step and become a Mahjong Time member! Members represent the core of the Mahjong Time community, and players that sign up for membership gain access to a huge number of bonuses, benefits, and much more! With a Mahjong Time membership, a player keeps an officially recognized ranking that never expires, and shows the world your skills and achievements. Members with official rankings gain access to higher ranked tables and tournaments, and the highest ranked members are placed in the "Top 100" community section of the game! Mahjong Time members also show off their individuality with custom avatars which can be outfitted with hundreds of different items in the avatar shop. Avatars can even be a picture of you! Additional membership benefits include: Bonuses on in-game item purchases, Unlimited settings (Tile color, Tile Style, Chat color, and more! ), Access to the Game Helper, a one-minute game pause if you disconnect, and a personal web page for VIP members! But that's not all! Members receive up to 50% discounts on tournament entries, 20% discount on avatar accessories, a reduced Dragon Chip rake (as low as 0%! ), and other special events and promotions! Memberships can be purchased on a "Monthly" or "Annual" basis, with Annual memberships offering nearly 20% in savings, for prices as low as only $4.16 per month! Unlock the full Mahjong Time experience and become a member today! *The Dragon Chips reloads are credited when the Dragon Chip balance falls below 1,000 Dragon Chips and if you have available reloads for the 24 hours period. 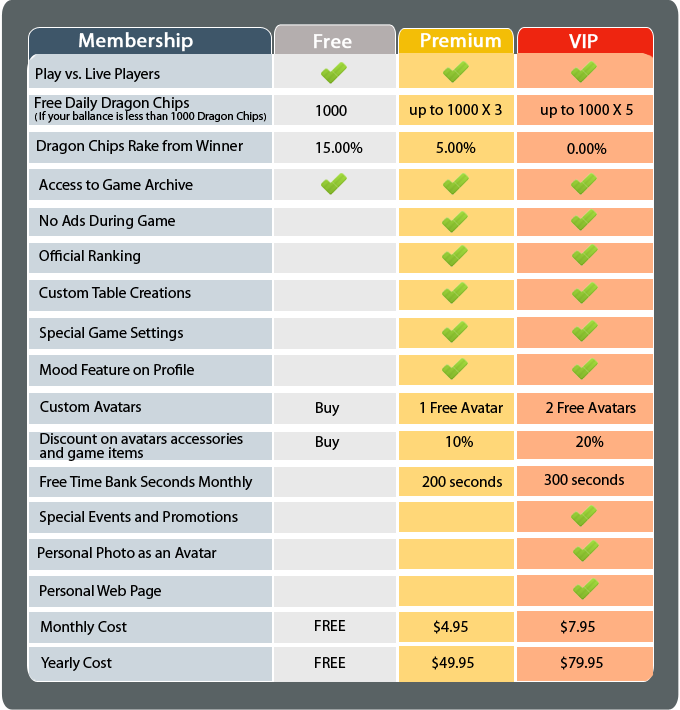 VIP members receive 1,000 Dragon Chips up to 5 times a day and Premium members receive 1,000 Dragon Chips up to 3 times a day.